Near the end of the Koryo Dynasty, 1389, General Yi Song-gye seized political and military power, deposing King Ch'ang (r. 1388-1389) and placing King Kongyang (r. 1389-1392) on the throne. He and capital in his fight against the declining Koryo monarchy and nobility. The Kwajonpop (rank land law) was instituted, providing not only land for General Yi to distribute but also the power to rule the country. He and his group were well aware that the ability to bring order and to end the decadent Koryo Dynasty lay in the land tenure system. Under the terms of status land system, land was ordinarily distributed for life only, on the basis of one's status or rank. Recipients were given the right to collect rents, while the peasant was given the right to cultivate. The customary rent amounted to half the crop and was usually paid as rent-tax to the state. Since the peasant, as tenant, was guaranteed land tenure in terms of cultivation rights, not subject to confiscation, his livelihood was improved. In addition, the accumulation of land by the yangban, or office-holding aristocrats, was strictly controlled by the stipulation that status land would be granted only in the Kyonggi areas around the capital, where the government could easily maintain supervision and surveillance. By resolutely carrying out land reform, Yi Song-gye and his followers grasped economic power. King Kongyang was forced to abdicate and Yi Song-gye's followers placed Yi on the throne, bringing an end to the house of Wang. Yi Song-gye renamed the dynasty Choson and he was given the dynastic name of T'aejo. The establishment of institutions of Confucian learning was given top priority in order to institute a Confucian state. A college and five municipal schools were set up in Hanyang, and local schools were established in all the magistracies. From these schools, Confucian-oriented scholar-officials were recruited for government office. The yangban class, acting in concert, had the power to interfere with the monarchial administration and decision-making procedures. Under Confucian precepts, the bureaucracy was to act as the agent of the monarch's will, since the monarch had a vested interest in benevolent rule. The monarch in turn had to heed the advice of the Confucian scholars. In this connection, the Office of Royal Lecturers and the Office of State Councilors (Uijongbu) were of prime importance. Below this were the six boards of administration - civil appointment, taxation, rites, military, punishment and public works - the principal government organizations in the capital. In provincial areas administrative divisions and magistrates under provincial governors carried out local administration. The Censorate Offices submitted memorials and remonstrances to the monarch and had the authority to ratify and rectify the monarch's appointment of officials and his renovative decrees. The court historians, who were to record daily happenings in the court and make verbatim records of the royal conversation, were empowered to criticize the monarch and keep him under close surveillance. In order to enhance Confucian learning, movable metal type was cast for the printing of Confucian classics and historical literature in 1403. Typography was developed and improved by the repeated casting of new fonts as a means of promoting Confucian studies for the welfare and prosperity of the state. Choson's fourth king, King Sejong the Great (r. 1418-1450), was noted for his mastery of Confucian learning. In addition to his embrace of Confucian values, he showed himself able to successfully heal with the yangban scholars. His rule in the mid-15th century was marked by progressive ideas in administration, phonetics, national script, economics, science, music, medical science and humanistic studies. He established the Chiphyonjon (Hall of Worthies) in order to promote research in institutional tradition and politico-economics. King Sejong showed great concern for the livelihood of the peasants, providing relief in time of drought and flood. He had Chong Ch'o compile the Nongsa chiksol (Straight Talk on Farming), a volume replete with information collected from experienced elder peasants throughout the country. The first of its kind in Korea, this became the classic work on Korean agriculture. He also put into effect a sliding tax scale which eased the peasants' burden. King Sejong ordered the development of the pluviometer in 1441 and distributed duplicates to the Office of Astronomy in Hanyang as well as to local magistrates to record precipitation. This preceded Gastelli's pluviometer of 1639 by almost 200 years. One of his most celebrated achievements was the creation of the Korean alphabet, Han-gul. Aware that his people must have a writing system designed to express the language of their everyday speech, and desirous that all his subjects be able to learn and use it, King Sejong impelled scholars of the Hall of Worthies to devise the alphabet. The Korean alphabet, which consists of 11 vowels and 17 consonants, posses geometric beauty, simplicity and scientific accuracy, and as such, can be learned by an uneducated man in a matter of hours. Confucian scholars raised considerable opposition and protested that the use of Korean script would retard Confucian studies. King Sejong persisted in this determination to promote Han-gul for the benefit of the people, and Humin Chong-um, of "The Correct Sounds for the Instruction of the People," was distributed in 1446. The official written language continued to be Chinese, as was Latin in Europe, but now the Korean people had at their disposal a means of writing in their own language. A bilingual poetic eulogy on the founding of the dynasty Yongbioch'bon-ga (Songs of Flying Dragons) was composed in Korean as well as in Chinese, and the Sokpo sangjol (Episodes From the Life of the Buddha) was translated into Korean. These works laid the foundation for the practical use of the Korean script. King Sejong also showed his concern for the health of the people by ordering the compilation of medical books. A 365 chapter compendium on Chinese medicine as well as the Hyang-yak chipsongbang (A Compilation of Native Korean Prescriptions) in 85 chapters, was completed in 1433. This latter included 959 entries on disease diagnoses, 10,706 prescriptions, and 1,477 items on acupuncture therapy. Another book on how to collect local medicinal material was also published in the vernacular language. King Sejong's interest in astronomical science was comprehensive and sun dials, water clocks, orreries of the solar system, celestial globes, astronomical maps, and atlases of the seven planets were produced at his instigation. He had a notation system for Korean as well as Chinese music devised or revised, and had on of his talented subject, Pak Yon, improve Korea's musical instruments as well as commissioned the writing of music for Korean musicians. In foreign relations, King Sejong took strong measures against the Jurchen tribes. The territory in the northeastern frontier area was restored and six fortresses were established after General Kim Chong-so quelled the Jurchen invaders in 1434. In 1443, King Sejong installed four counties on the northern border, and opened three ports to the Japanese to help trade. 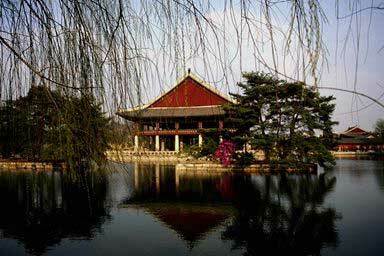 King Sejong's land tax reform, health policy and invention of the Korean alphabet all contributed to the improvement of life of the people. King Sejong was able to realize the Confucian state in the true sense of the word. He also engendered a modern national consciousness in the minds of the people. Although he had earlier confiscated temple lands and bondsmen and otherwise restricted Buddhism, he later became especially devoted to that faith after the death of his beloved Queen. His health declined during that period, and he abdicated the throne to his son King Munjong (r. 1450-1452). Unfortunately, his legacy of stability and prosperity was not sustained by his short-lived successors. King Munjong's death in 1452 brought an 11-year-old Crown Prince to the throne. State affairs were left in the hands of state councilors, and monarchical power declined. In 1455, the unscrupulous Prince Suyang taegun, uncle of the child-king Tanjong, usurped the throne by murder and regicide after quelling the opposition; he also ruthlessly suppressed attempts to restore Tanjong as king. King Sejo (r. 1455-1468), as Prince Suyang Taegun is officially known, closed the Hall of Worthies, abolished some posts in the Censorate Offices, and crippled the Office of Royal Lecturers (Kyong-yon), all measures designed to loosen the ideological restraints on the monarchy. The Office of Study Promotion was instituted, ostensibly as a means of promoting Confucianism. In fact, it was used merely as a royal library rather than as an organization designed to promote and propagate Confucian ideals. Further, he initiated the practice of giving private audiences to individual officials, flouting the regulation which made the presence of historians and censorate officials mandatory at royal audiences. An attempt to raise the status of the monarchy was, however, justified, as the Korean monarch had formerly been vulnerable to inordinate yangban pressure. Yang Song-ji, a talented scholar under King Sejong, advocated the monarch's cause in his memorials. Yang stressed Korea's unique position, asserting the need to preserve indigenous traditions. Tan-gun, according to him, was the "Son-of-Heaven Ruler." He formulated the proposition that Choson, like China, was a nation upon which the "Mandate of Heaven" was bestowed. This argument strengthened King Sejo's hand visa-vis the bureaucracy. None of the Choson kings had been strong enough to defy the yangban officials by praying in person at the Temple of Heaven, where the Song of Heaven along was qualified to converse with the Heavenly God. King Sejo, however, in his sacrificial ode to the Heavenly God at the Temple of Heaven, used the phrase "the founder of the dynasty, the imperial great-great grandfather, T'aejo (founder king Yi Song-gye)." King Sejo ordered the compilation of a detailed map of Korea to provide further control of outlying areas. Census-taking of all soldiers and reserves in the various districts was enforced, and the Civil Register Act required all citizens to carry identification tags. He installed large military garrisons in each province and ordered every town to produce arms. By arranging generous land grants and medicine, King Sejo showed his concern for the welfare of the army. He also ordered the migration of people to the sparsely populated northern border areas. The monarch acted decisively in matters relating to the recruitment of new officials, increasing the number of military graduates to further strengthen the monarchial power. He also gave the title of "Meritorious Subject" to various officials on three different occasions to widen the base of loyal support. With the increase of inheritable land grants to meritorious subjects, however, land available for the newly appointed officials decreased. To solve this problem and to limit the economic power of the officials and yangban, King Sejo instituted the official land system, which allowed land grants in terms of rent for office tenure only. Thus the status land system by which the yangban enjoyed lifetime tenure was discontinued, and those parties who refused to compromise lost their land holdings altogether. This limitation of land grants to incumbent officials meant that the old landed yangban class changed to either an employed bureaucracy with land or landless yangban with prestige only. King Sejo offered interim civil and military service examinations more often, in addition to the time-honored examinations given every three years. Since the number of successful candidates in the interim examinations exceeded those from fixed examinations by a ratio of two to one, this virtually brought the civil examination system under the monarch's sway. To divert the attention of the Neo-Confucian scholars, King Sejo defied Confucian orthodoxy by support Taoism and Buddhism. An Office for Publication of Buddhist Scriptures was established, where the compilation of Buddhist literature and Korean translation of such literature became active. Fifty copies of the bulky Tripitaka Koreana were printed for distribution. To equip the often Sinocentric scholars with a comprehensive history of their own country, the compilation of Tonggukt'onggam (Comprehensive Mirror of the Eastern Kingdom) began in 1458 and was completed after the king's death. During this time, the compilation of the Kyongguk taejon (Grand Code for State Administration) was initiated. The Kyongguk taejon became the cornerstone of the dynastic administration and provided the monarchial system with a sory of constitutional law in a written form. The ninth King of Choson Dynasty, Songjong (r.1469-1494) ascended to the throne as a child and ruled under the regency of the dowager queen and minister-consultants. The anti-Sejo literati used the institution of the royal lecture of try to abolish Buddhist rituals and other anomalies in the life of the court, and the unfortunate child was subject to a rigorous schedule of two and four royal lectures per day. The Office of Study Promotion was expanded to serve as a censorate in addition to providing royal lecturers. Heavy Confucian indoctrination was the order of the day, and state support of Buddhism gradually diminished. During King Songjong's reign, officials' rights to collect tax and rent from official land as personal income began to wane. Young scholars were treated well and given opportunities at the newly established Hall of Leave for Study, and Confucianism once again found its place in the royal administration. An ambitious publication program was implemented, producing such works as a compendium of Korean historical geography, also issued was an anthology of Korean-Chinese literature, as well as an illustrated text on traditional music. Such efforts to restore Confucian rule were not sufficient to satisfy the scholarly class in general, however. Those among them who had suffered discrimination during King Sejo's reign gained a foothold at court, but economic conditions were not greatly improved. Following the implementation of a central collection and distribution of rent policy on the officials' land, the officials and yangban sought land control for the right to farm, thereby encroaching upon the peasant's share of land ownership rights. Moreover, land area grew as a result of reclamation, and this contributed further to the growth of agricultural estates, a process which the dynasty attempted to prevent. Some agricultural estates gathered bondsmen and peasants, many of whom abandoned their free status in order to escape the heavy land tax, corvee, and tribute taxes that have been imposed on them. As the desire to hold landed interests became more intense, those yangban who had already established themselves as the owners of meritorious subject land, special land grants, reclaimed land, or accumulated landed rights to cultivate land suddenly became targets of intense criticism. Those literati who could not afford land became impoverished. These literati upheld the family and clan rites and etiquette prescribed by Neo-Confucian doctrine, but were impoverished by the costly rituals involved - marriages, funeral and memorial ceremonies. To maintain themselves, they depended heavily on their kinship ties, relying on assistance given by an appointed official of the same kin group. These mutual assistance relationships affected both officials in the capital, and landed yangban in the outlying areas as well. This was also a key factor in the politico-economic life of each yangban during the Choson Dynasty and was intensified during King Songjong's reign. Kim Chong-jik (1432-1492) was a leading scholar-official with many followers, who advocated the Neo-COnfucian rectification theory which implied condemnation of King Sejo's usurpation. His success represented for a while the peak of the resurgent Neo-Confucian school. King Songjong's successor in 1495 was King Yonsan-gun, whose reign was noted for his unscrupulous suppression of the literati. In the initial period, he was hard-pressed by that clamorous group which opposed Buddhist rituals observed at the death of the Queen mother. Infuriated by the hundreds of memorials and protests made by the Neo-Confucian literati, King Yonsan-gun lashed out at them. His first purge was based on an accusation of state crimes because one of Kim Chong-jik's students had implicitly criticized King Sejo's usurption in his historical notes. Through this purge and another which followed in 1504, King Yonsan-gun eliminated the checks exercised by historians, the censorate, and state councilors. Confucian statecraft almost collapsed. His extraordinary anti-Confucian and anti-Buddhist acts contravened the Kyongguk taejon and dismayed the yangban as a whole until he was finally deposed. It fell to King Chungjong (r. 1506-1544), supported by the officials who has deposed King Yongsan-gun, to restore Confucian rule. The resurgence of the Neo-Confucian school made the enhancement of the economic status of the literati an urgent necessity. Some were rewarded with meritorious subject land, but other found a solution through securing charters for private schools endowed with some land and bondsmen. Such local private schools became the intellectual training ground for new schools of thought. The increase of refugee peasants contributed to the ever increasing burden of taxes upon the remaining peasants. Cho Kwang-jo, an influential school official, advocated the recommendation system for the recruitment of government officials and the organization of local guilds to improve the impoverished condition of the literati. The recommendation system was implemented and his group was recruited for official posts, but this along did not satisfy them since they were not rewarded with appropriate land. In 1519, the year they achieved their goal of implementing the recommendation examination system, these Neo-Confucian scholars faced a spurious charge of treason. The ministers and the literati were often embroiled in royal succession problems, and competed among themselves for places in the bureaucracy, especially since their numbers had rapidly increased with the expansion of private schools. Their common interests based on local school and kinship organizations were bound to split them into factions, all the more bitterly divided for being within the same status. The number of private schools exceeded one hundred in the late 16th century, and eminent scholars of the Neo-Confucian philosophy sheltered themselves in such institutions. As for the people in general, they were hard-pressed by the levies of land tax, corvee, military tax, service and especially tribute tax, which was collected by authorized agents. The growth of agricultural estates accelerated, contributing further to the decline of the peasant economy. A righteous outlaw named Im Kkok-chong rose up against the greedy officials and distributed it to the poor. He seized government granaries and gave relief to hungry people in the provinces of Kyonggi-do and Hwanghae-do. Although he was caught and beheaded in 1562, his chivalry and revolutionary ideas captured the admiration of the people and inspired the popular novel, Hong Kil-tong chon, the Tale of Hong Kil-Tong. The founder of Choson Dynasty, King T'aejo distinguished himself in his resistance to Japanese marauders. After the latter's depredations had ceased, Korea opened three ports for trade with Japanese feudal lords, giving investiture to the Tsushima lord who had been engaged in lucrative trade with other ranking Japanese. The Japanese liaison officers staying at these ports caused trouble at times, however, and the amount of Choson's grant was reduced. After the assassination of Oda Nobunaga, who temporarily called a truce among Japan's warring lords, Toyotomi Hideyoshi rose to power in 1590. Hideyoshi's problem was to find a way to weaken the powerful feudal lords of the western part of Japan. In this explosive domestic situation, he looked abroad and decided that an invasion of China would provide the outlet needed for a peaceful solution at home. When Choson rejected Hideyoshi's request for aid in attacking China, he ordered his general to invade Ming and Choson in 1592. The Japanese army, armed with matchlock guns with which Choson soldiers were not familiar, reached Hanyang within two weeks. They had attempted to invade the granary Cholla-do province, only to meet the strong resistance of the people led by General Kim Shi=min at Chinju. They then turned back toward Hanyang. King Sonjo and the royal princess fled to the northern provinces and appealed to the Ming Emperor for aid against invaders. The Japanese generals squabbled among themselves, while Choson's Admiral Yi Sun-shin conducted a brilliant series of operations in the South Sea, destroying many Japanese ships. The ironclad Kobukson (turtle ships), which Admiral Yi improved with plated armor resembling a turtle shell, protected the sailors and marines, and were more than a match for anything else afloat. With the appearance of the allied Ming contingents, the Japanese were forced to fight a combined Ming-Choson allied army. Cut off from supplies and reinforcements owing to Admiral Yi's control of the sea, the Japanese were severely weakened. A Choson volunteer army organized in the southern provinces them with guerrilla tactics, while disease and malnutrition took its toll. Peace negotiations were held between the Ming general and the Japanese, who had by then lost the will to fight and started to retreat, stalked by volunteer peasant forces and contingents of Buddhist monks. Peace negotiations dragged on for five years but proved fruitless, and Hideyoshi sent his army to Choson again in 1597. The invasion this time encompassed only Kyongsang-do province and part of the Cholla-do province, as the invaders were harassed by the volunteer army. The Japanese retreated and Hideyoshi's death forced the evacuation of his forces. Admiral Yi, in his attempt to smash the Japanese retreat, was struck by a stray bullet and killed during the climactic naval battle. The war ended at long last, with grave impact upon Choson, Ming China and Japan. The results of the Hideyoshi invasion brought about the destruction of government records, cultural objects, archives, historical documents and many works of art, the devastation of land, decrease in population, and the loss of artisans and technicians. Arable land amounted to only one-third of the prewar acreage, and the resulting decrease of revenue necessitated additional taxation of less devastated provinces such as Kyonggi-do or Ch'oungch'dong-do. The government resorted to selling official titles and yangban status, and on occasion, held an examination for government service open to the bondsmen class. The loss of artisans brought a decline in handiwork quality, as well as in manufactured goods such as pottery and book printing. The Neo-Confucian norms and values were shaken, and the class distinctions which the yangban tried to uphold began to slowly crumble. The Japanese, on the other hand, achieved a peaceful, centralized feudal society under Hideyoshi's successor, Tokgawa Ieyasu. Importation of the political philosophy of Neo-Confucianism and the study of medicinal materials and therapy developed in Choson also helped Japanese scholars make significant contributions to their society. The introduction of typography with moveable metal type expedited book printing, and Choson artisans captured by the Japanese army developed ceramic and textile products. After the Tokugawa takeover, Japan wanted peaceful diplomatic relations with Choson in order to benefit further from the Choson version of the Chinese culture. For Ming China, however, the results were catastrophic. The economic setback suffered in the campaign later let to the collapse of the dynasty in 1644. Search results will be shown at the bottom of the web page. If you believe AsianInfo has quality, useful information and would like to help - become a Sponsor! If you are a corporation and would like to place advertising on our site, click here.